Alex Tsiridis and Hüseyin Evirgen have been a staple of Munich-based deep techno outlet Prologue since 2011. With a string of EPs and a 2013 mini album, Tiamat, their acidic, free-form style has helped to define the sound of their powerhouse label. This year, however, it feels like Cassegrain has finally broken through to a new level of productivity and stature. With a stellar remix package on Prologue featuring Svreca, Inland, Mike Parker, and TM404, as well as an EP, Blood Distributed as Pure Colour, leading up to the new album, Cassegrain and Prologue have managed to leave deep techno lovers salivating in anticipation of Centres of Distraction. With all the hype they’ve built, it could easily have turned out that the final product was an anti-climactic bust. However, with Tsiridis and Evirgen at the controls, the long-awaited album does not disappoint. 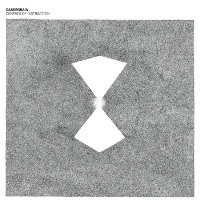 Cassegrain are masters of texture and sound design. You will almost never hear recognizable sounds like 808s and 909s in Centres of Distraction. Instead, Cassegrain manage to build fully fledged tracks full of rhythm, melody and narrative power out of carefully crafted synth leads, bursts of mangled noise, and grinding pads that beg to be heard in a cavernous warehouse or mega-club on a top-notch system. Reviewers often legitimately gripe that techno has an uncomfortable relationship with the album format. It can be hard for listeners to get through a full length techno album in one sitting, and it can be equally hard for artists to avoid devolving into pointless experimentalism for its own sake, or simply packaging a set of DJ tools into an album when they would have been better as a set of EPs. Cassegrain manage to avoid this trap by keeping the tracks on Centres of Distraction relatively short (the longest comes in at 6:27) and cutting out unnecessary bulk. The album does have some low points- “Glasshouse” and “Seldom Cloud” seem like afterthoughts rather than fully evolved tracks- but the fact that these tracks fail to shine is due more to their context amongst beautifully crafted, captivating stunners than the tracks’ own lack of merit. “Resilin” and “Empress Cut in Segments” are really the high point of this album for me, with their power and emotional depth, and I wish that Cassegrain had explored this direction a bit more on this album. Nevertheless, the album is a thrilling expression of the potential Cassegrain has for exploring new sonic frontiers. Jeff Mills once said “Techno music is actually something that you can’t imagine. If you hear something that you’d never expect to hear, that’s techno.” If that’s the standard by which we are to judge Centres of Distraction, then the album certainly deserves its place as CGNY’s Album of the Year 2014.